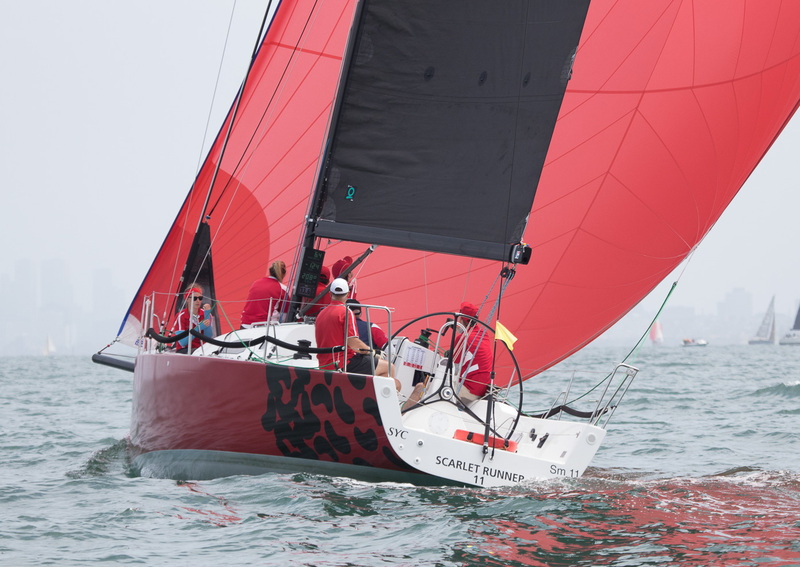 (Adelaide, South Australia)- Rob Date and crew from the J/111 SCARLET RUNNER 11 recently sailed in the 160.0nm Adelaide to Port Lincoln Race, followed by the Teakle Classic Lincoln Week Regatta. Rob’s J/111 home port is near Melbourne in Victoria, so the crew sailed the 550+nm trip to Adelaide against the predominant westerly “roaring 40s” winds to compete in the regatta! The SCARLET RUNNER crew was, for the most part, inexperienced offshore ocean racers. The team included Rob’s daughter, his future son-in-law, his best mate for more than 40 years, and the balance being the usual inshore race crew; there was seven crew in total. The Adelaide to Port Lincoln Race started in the blue waters of the Gulf of St Vincent off Adelaide. FOrty boats left the Outer Harbour/ North Haven Marina in Adelaide on Friday about 3.00pm to compete in the 160 nautical mile race. It is “South Australia’s Premier Ocean Race” and, now in its 69th year, it has proven that it provides all the challenges of a Category 3 offshore race. The route takes the fleet southwest from Adelaide to Marion Reef at the foot of York Peninsula along the foot to the spectacular Cape Spencer. Then, the fleet heads northwest past Wedge and Thistle Islands and Dangerous Reef to Port Lincoln, nestled snugly in Boston Bay. The race started with a port tack beat for 35.0nm. After passing Marion Reef, the course freed up. SCARLET RUNNER 11 put up the code zero and was doing 14 kts with the occasional knock down. Unfortunately, the zero did not last the distance. After passing the bottom of the York Peninsula, the J/111 went into downwind VMG running mode as the wind pressure dropped. The final 20.0nm had them running downwind under A1 spinnaker. SCARLET RUNNER 11 achieved the fastest time for this section of the race. The distance race was then followed by the Teakle Classic Lincoln Regatta with a mix of inshore and coastal courses over four days. The fleet sailed six races, making the most of the fantastic sailing in Boston Bay and among some of the surrounding Islands. One race finishing at an isolated beach for a BBQ, drinks and beach cricket. Then, the second race of the day was a downhill sleigh ride back to the marina! It was a cracker of day, that one! At the conclusion of the regatta, after all points scored for the Adelaide to Port Lincoln Race and the Lincoln Race Week, it was SCARLET RUNNER 11 that topped the Division 1 leaderboard- scoring 1st on AMS (9 points), 1st on PHS, and 2nd by just two points on IRC. That was a very impressive result considering the competition, which included a Farr 40, First 45, First 47.7, Melges 32, Sydney 38’s, and a Sydney 47. Congratulations to Rob and the crew and we hope for fair winds for their homeward journey to Melbourne. Sailing Photo Credit- Alex McKinnon Photography Add to Flipboard Magazine.